Episode #20 – The Hunt (Jagten, 2012) and Random Recommendations | That's a Wrap! In our 20th episode, we look at The Hunt (Jagten, 2012). This Academy Award nominated Danish film from visionary director Thomas Vinterberg is a powerful, wrenching and honest exploration of the malleability and fallibility of human behavior. 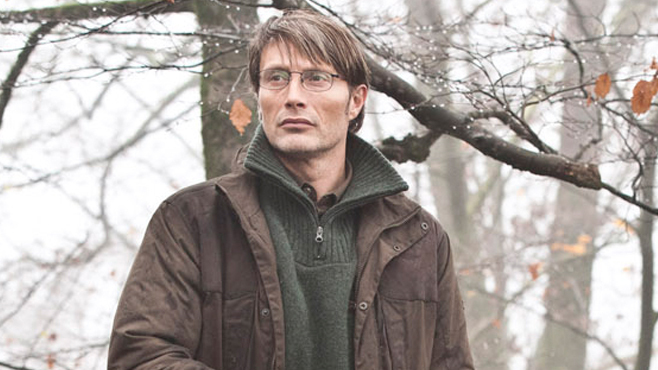 The Hunt tells the tale of Lucas (Mads Mikkelsen), a divorced day-care worker (laid off from his secondary ed position) wrongly accused of sexually inappropriate behavior with his best friend’s daughter, Klara. Before long, groupthink hysteria brings the community to brutal acts of cruelty against Lucas and his family. Our second segment presents some random recommendations from the That’s a Wrap! staff. Erik discusses a favorite Youtube Web-series, Nick recommendations a childhood favorite and Chris props up a graphic novel he admires.